For Americans, February 2nd is Groundhog Day offering a weather prediction; in Poland, where national holidays are mainly based on the liturgical calendar, it’s Candlemas, 40 days after the birth of Jesus. It commemorates the purification of Mary (in Biblical times, women were seen as impure after giving birth) and the Presentation of Jesus in the Temple (once the mother’s purification is complete, the grateful parents take the child to the temple to give thanks and offer sacrifices), and it marks the end of the Christmas season in Poland. Seriously, this is the day to put away Christmas decorations. Not to worry, after Candlemas, we can begin to think about paczki! Candlemas is traditionally celebrated by the priest blessing the beeswax candles that will be used in the church for coming year, and also blessing candles that the parish will use in their homes. This has special significance in Poland because of the ancient Slavic protective ritual of the Thunder Candle. It is so significant that the holiday in Polish is Święto Matki Bożej Gromnicznej , referring to the Holy Mother of God and the Thunder Candles. The ancient Thunder Candles were lit during a storm to offer protection from lightening, and also from wolves. 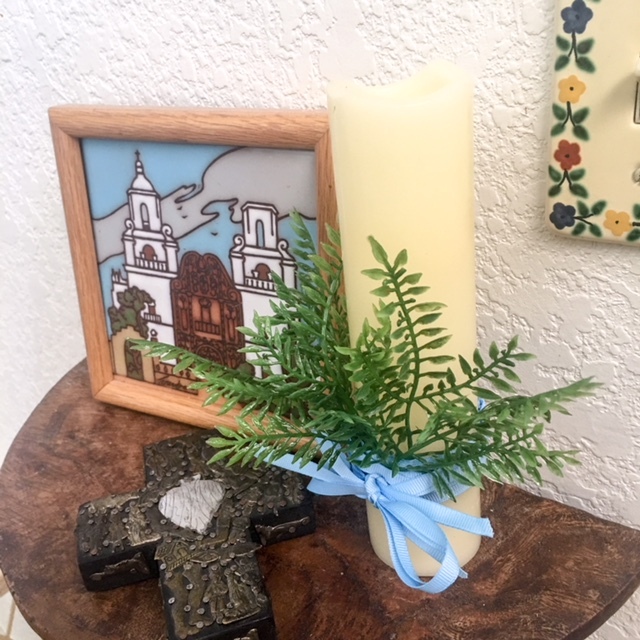 Thunder candles are long and thick, may be decorated with religious inscriptions or images, fir branches and flowers, tied with a light blue ribbon to represent Mary. Today they are used for special celebrations, and blessed annually on this day to be recharged so to speak. The candle may be a gift at birth and used at First Communion, Confirmation, Anointing, or during a vigil before someone’s death, even being buried with the owner. And that, my dear friends, is all I know about Candlemas Day in Poland and the Thunder Candle. PS — Yes, I’m taking down our Christmas tree. I just love having it up, so I’ve gladly adopted this Polish tradition! Thank you Lois…..another piece of my Polish heritage that I did not know. I really like the tree portion and will adopt it next year by leaving my little one up until now to brighten these frigid days. Here in Ottawa, Canada our high will be -25 Celsius with a wind chill dropping it to -38. Sigh. Yup it’s the great frozen north but we are survivors. Can you email us some heat????? Oh my, Elizabeth! Such cold! Ed’s first winter in Poznan had similar temps, lucky for me it was a regular occurrence. We’re higher than normal this week, 25 C. Not to worry, you’ll be able to gloat this summer. Thanks for the wonderful post today. Learning some of the traditions of Poland. I really appreciate that! My pleasure, look forward to seeing you and Kevin next month! Nice to see the Polish traditions posted. Most don’t know why we have such days. Pozdrawiam. I really enjoy the posts about Poland as well as the recipes. My tree is still up as I am cataloging my ornaments as I put them away until next year. But now I can tell Hubby that this is why the tree is still up. LOL, glad to provide an excuse, Frances! Thank you for a tradition I didn’t know about. Maybe I need a Thunder Candle to go with the Blessed Palm that we learned to burn for storms. I still do that during bad storms. While I don’t celebrate Candlemas, there was the year I took my Christmas tree down on Valentine’s Day! Why rush these things? I love reading about the celebrations and traditions in Poland – thanks, Lois! My Mom mixed fresh cabbage with the sauerkraut, some onion, a can of tomato sauce and pork spareribs. Hi—I’m looking to buy a thunder candle for my 86 year old Polish mother. The one we had growing up is gone. Can you help me find a source? Thank you so much! I haven’t come across any sources for thunder candles in the US. Unless you know someone making a trip to Poland, you might just make your own. The key thing is the priest blessing the candle. You would bind dried flowers or greens to the candle with blue ribbon (blue for the Holy Mother). There may be others who can suggest more specific botanicals, but I’m sure they were just using what they had nearby. Blessings on you and your mother.